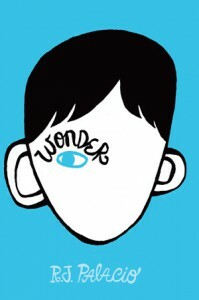 “Wonder” (Knopf 2012) by R.J. Palacio is the story of August who has a radically deformed face—no ears, his eyes at cheek level, a cleft palate which has required numerous surgeries. He’s smart and funny, but you can almost imagine the torture he endures from children and adults both, especially when he starts school for the first time in the fifth grade. Early in the book August resists having to go to school. He says, “I miss being a baby, not knowing stuff.” Innocence is blissful —particularly for August. August tells his story, but so do others, deepening and widening the reader’s understanding of August’s life and the many lives he affects. Some voices are of fellow fifth graders. Summer befriends August. She doesn’t think he looks so scary. Jack, on the request of the principal, befriends August. Jack forgets about August’s odd appearance and they seem to be friends. But his painful betrayal feels true to life. August’s older sister, Via, 14, just starting high school, adores August. But how complicated it is to always have to make sacrifices for him. His problems are always bigger than hers and he always gets more attention from their parents. She understands this, of course, but sometimes she needs attention, too. Via’s ex-friend, Miranda, cherished August when they were younger, but now she’s moved on to have friends other than Via, which is hard for both Via and August. Via’s new boyfriend sheds light on August’s loving family and makes the reader see that, yes, things are rough for August, but people adore him in a way most people aren’t adored. He says, “The universe takes care of all its birds.” It’s hard not to love these characters. Both family and school scenes feel authentic. There’s no cuteness. The author understands feelings, their subtleties, and when our behaviors surprise us, especially in adolescence. We don’t always know why we act as we do, but we can feel the consequent emotion immediately—for instance, shame. Mr. Browne, the English teacher, asks his students to observe monthly precepts. September’s precept: Given the choice between being right or kind, choose kind. This story, without being pedantic, is the perfect anti-bullying book. Every class should read it. The book shows people behaving both badly and wonderfully. I guess that’s why the name is so apt. “Wonder.” I loved this book. Patricia Hruby Powell is a nationally touring speaker, dancer, storyteller, occasional librarian, and children’s book author. Her new book “Joséphine: The Dazzling Life of Josephine Baker” will be released by Chronicle Books in October 2013. Beautiful. I can already feel it. I loved this book, even when it made me feel uncomfortable. The main character was so endearing I couldn’t put it down. I felt the same way, Louann. And Doro.